A historic north-east harbour has been given a renewed focus thanks to its latest addition. 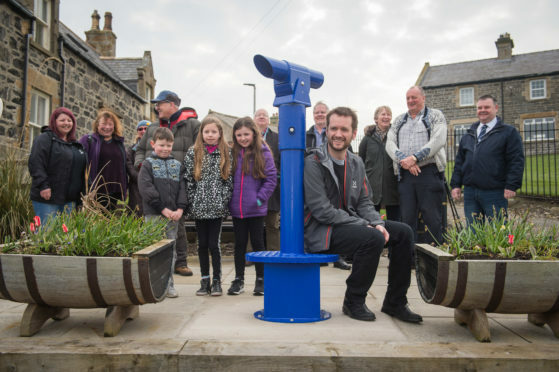 Portsoy Community Council have paid for the installation of a telescope at the quayside and a film star visited over the weekend to officially unveil it. Sean Biggerstaff starred in the 2016 remake of Whisky Galore! as Sergeant Donald Odd and returned to the town on Saturday. The telescope, which can be found at Liberty Gardens near the Shore Inn, offers views of the 17th century harbour, the waters of the Moray Firth and on a clear day the Caithness hills. Moira Stewart, secretary of Portsoy and district community council, said the entire project was possible following a string of successful funding bids. She expects the £5,000 looking glass to be a hit with locals and visitors over the next few months. Mrs Stewart said: “We were lucky enough to get a substantial grant from the Banff and Buchan area initiative fund. “This along with help and support from Portsoy 75 Club and Portsoy past and present both financial and practical have made it possible. “As we are known as the dolphin coast we hope that the telescope will be used to view the many dolphins that are often seen in the waters. “You also get a fantastic view of any passing boats. We hope it will be an attraction for visitors. They can have a lovely walk around Portsoy and a peaceful seat in Liberty Gardens enjoying the view. Mr Biggerstaff, who was in Portsoy to speak at the fundraising dinner for the annual boat festival, welcomed the new addition to the port. The telescope is free to use, although Portsoy and district community council do have a donations box attached to it.